Warehouses and shipping centers see countless products move through them daily, making a trusted means to identify and keep track of each item a necessity. By clearly labeling each product, including barcoding, shipping managers can closely monitor activity and assure that things are headed to the correct location. Since the labels play such an important role in the processing of shipping and warehousing, it makes the process and the equipment being used a critical component of operations. Most shipping departments use one of two methods for reliable label printing: Thermal Printing and Direct Thermal Printing. Each has its’ advantages and challenges depending on the type of labels you are printing and the environment that they are in. Thermal Printing uses ink and a ribbon to melt ink onto the label’s surface, and is the most effective and efficient way to print barcodes and shipping labels since thermal printers can produce the exact bar widths needed in the printing and scanning of barcodes. This technology creates high quality images with pinpoint accuracy and superior edge definition, and is ideal for sustained high-volume usage. Using a ribbon adds print durability which usually causes the print to last longer than direct thermal, allowing thermal labels to withstand extreme temperatures. The use of ink and a ribbon also makes color label printing an option, giving the ability to boost your branding with color logos and graphics. The biggest disadvantage over direct thermal printing is the cost to use. The cost of materials is added to the increased maintenance and repair, making it a fairly costly method. Direct Thermal Printing uses heat activation to blacken the desired areas on the heat sensitive label material. Since there is no need for ink and ribbons, this method provides very low printing costs compared to thermal printing. 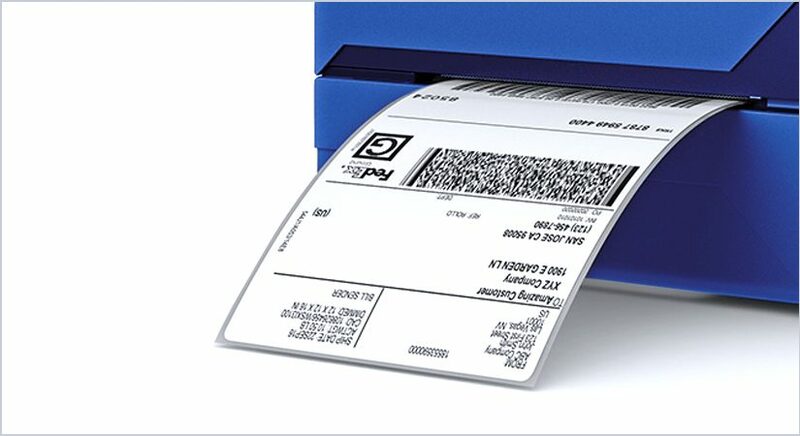 Direct thermal labels lack the durability of their thermal printing counterpart, making it more appropriate for short-term, high-volume printing. Less components also makes direct thermal printers easier and less expensive to repair and maintain, as well as reducing their carbon footprint, making them a more earth-friendly solution. Labels printed through direct thermal printing are limited to black print, and will fade over time or when exposed to sustained heat or light. Since labels are such a vital part of many shipping and warehousing operations, the printing method used can be a very important decision. Direct Thermal labels are less expensive to use, but are limited in longevity and print clarity, whereas thermal printing provides superior definition and print durability but with a significantly higher price tag. Knowing the main differences and limitations of the two main label printing methods will equip you to choose the best delivery method for your organization. « Previous Post: When Should High Visibility (Hi-Vis) Apparel be worn?